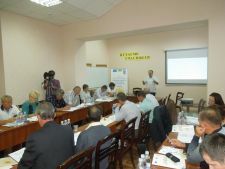 On 29-30 September, 2015, Cooperative managers and accountants from Mykolaiv, Odesa and Kherson regions gathered together in Mykolayiv region to study theoretical and practical aspects of accounting, taxation and reporting in agricultural services cooperatives (ASCs), supported by the EU/UNDP “Community Based Approach” (CBA) Project. Training combined with study visits to ASCs created in Mykolaiv region during the second phase of the CBA Project. The cluster event supported knowledge and best practices transfer from “older” to “younger” cooperatives. Trainees also heard about obstacles and bottleneck in existing legislation and practical advises how to avoid it.